For minor scrapes and cuts, the priority is to prevent infection. 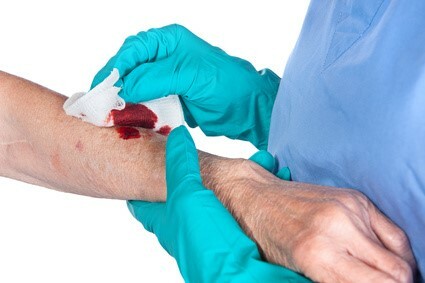 For more serious bleeding you need to stop the bleeding to reduce the onset of shock, which can kill. If there is an object protruding from the wound, apply pressure around the wound. Never try to remove an object, as that could make the bleeding worse. If a casualty is suffering from internal bleeding, it may not be obvious from the outside. The secondary survey aims to spot potential areas of internal bleeding, which are typified by swelling of the skin. If the casualty is displaying signs of Shock, it may be necessary to conduct a further survey, but lifting clothing an area at a time. If a casualty has received a blow to the abdominal area, internal bleeding would be one of the things to be aware of and check for. Likewise, if a casualty has fallen and is complaining of severe pain to an upper leg (femur), that could indicate a fracture with consequent severe internal bleeding. All cases of suspect internal bleeding are medical emergencies and help should be called for without delay.